A descriptive statement is one which is characterized by description; it is a presentation which sets out to describe. By so doing a descriptive statement expresses a quality or qualities regarding the topic matter(s) under consideration. Certain identity may be communicated as a result of employing descriptive statements by limiting and/or modifying specific understandings of the subjects to which they address. Descriptive Statement: Whoever is convicted of a felony is a felon. Let us flesh this out just a little bit more. If someone is convicted of a felony yet is a superior court judge, is he still a felon? The true descriptive statement under consideration regards everyone, without exception, who has the quality of having been convicted of a felony as being a felon. Anyone who has received the Noble Peace prize and is convicted of a felony is a felon. Anyone who is Reformed in their theology and is convicted of felony is a felon. Anyone who cures cancer and is convicted of felony is a felon. Anyone who (fill in the blank) and is convicted of a felony is a felon. This descriptive statement is absolute in its purpose of identifying everyone who is convicted of felony as a felon. Again, no matter what else may be true of the one convicted of a felony, according to this statement (which has been taken as a statement of fact for the sake of argument) the one convicted of a felony is a felon. So whenever this question concerning certain identity is asked, "Who is a felon?" the specific and exceptionless answer is "Whoever is convicted of a felony." This cannot be overemphasized. No matter what else may be true about a person who is convicted of a felony, he is absolutely identified as a felon. The Apostle John's heart yearned for Christians to be in fellowship with God the Father and the Lord Jesus Christ. This very desire of his was the theme and focus of the First Epistle of John (1 Jn 1:3). For John, love is a hallmark of the one who is in fellowship with God (1 Jn 4:16b). If someone says, "I love God," and hates his [Christian] brother, he is a liar; for he who does not love his brother whom he has seen, how can he love God whom he has not seen? If a believer says that he loves God and coincidentally hates his Christian brother he speaks falsely concerning his affection toward the Most High precisely for the reason that John gives in the aforementioned verse. At any cross-section of time that a child of God hates his brother he is not loving God. Therefore it is incumbent upon the Christian to love his brother. John, the Apostle of Love, utilizes a descriptive statement in order to positively identify regenerate men and women for the benefit of his saved audience in order that they may know who are to be the beneficiaries of their familial love. He does so using a statement similar to the one above that identifies felons. When answering the question, "Who is a Christian?" the Apostle John answers, "Whoever believes that Jesus is the Christ." John positively identifies Christians for his audience by describing them as those who believe that Jesus is the Christ. 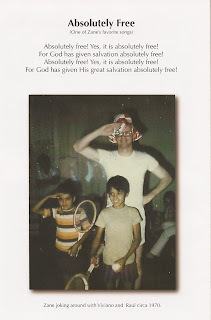 For John, anyone who believes that Jesus is the Christ is born-again, no exceptions: "John's definition of a Christian brother is simple and direct. Whoever (there are no exceptions!) believes that Jesus is the Christ is born of God" (Zane C. Hodges, The Epistles of John pg 212). No matter what else is true about someone, if he believes that Jesus is the Christ, he is a born-again Christian. I hope that this statement will go without objection, for it follows the logic demonstrated above in the example about felonies and felons. Precisely identified by the Apostle John, a Christian is one who believes that Jesus is the Christ; said another way, no one who believes that Jesus is the Christ may be excluded from being identified as a Christian brother or sister. Jesus of Nazareth came in the name of God the Father and in the power of the Holy Spirit. He presented Himself to Israel as the Christ, confirming so by signs, wonders, authoritative teaching, and works of mercy and compassion. Because of these testimonies many were persuaded that Jesus of Nazareth was indeed the promised Christ. Andrew and most likely the Apostle John believed that Jesus is the Christ (Jn 1:40-42), and according to the writer of this gospel, whoever believes that Jesus is the Christ is born of God (1 Jn 5:1). It should be of great note that this occurrence happened very early in Jesus' ministry. Phillip and Nathanael affirmed His messiahship very soon afterward (Jn 1:43-49). Following these events, Jesus started attracting disciples. His disciples are shown to have believed into Him at the time of His first sign miracle (Jn 2:11). Another example would be the Samaritans of Sychar. The woman at the well first believed that Jesus was the Christ (Jn 4:29), based solely upon Jesus' prophetic statements about her life. This woman went into the village and told the inhabitants about Jesus. Next, many of the people of the village believed into Jesus as the Christ. 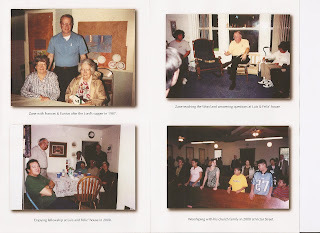 Of great note is John's statement, "And many of the Samaritans of that city believed in Him because of the word of the woman who testified, 'He told me all that I ever did'" (Jn 4:39). Based solely on this immoral woman's testimony of Jesus' prophetic gift, "many of the Samaritans" believed in His messiahship. Please note that this woman's testimony did not include an explanation of the hypostatic union of Jesus and the substitutionary death and physical resurrection. These Samaritans heard, through a severely tarnished vessel, a simple attestation to Jesus' ability, which supported His claim that He was the Christ. As a result of the evangelistic endeavors of Jesus, many Samaritans were persuaded that Jesus was the Christ (Jn 4:42). Many more examples could be multiplied! These will suffice for our purposes. These events happened within the first year of Jesus' ministry. This is an important consideration because Jesus did not reveal to anyone His death and resurrection until His third year of ministry (Mt 16:21; Mk 8:31; Lu 9:22). It is crucial to note here that even after giving them this information that they did not believe such would be the case, evidenced by Peter's reaction to Jesus' statements: "Far be it from You, Lord; this shall not happen to You!" (Mt 16:22). Furthermore, after Jesus had died (thus fulfilling part of His prophetic foretelling in Mt 16:21) the disciples did not believe in Christ's resurrection, even after it was reported to them by two different sources (Mk 16:10-15)! What can we make of this information? We must certainly conclude that the disciples and the common folks of Jesus' time believed into Him as the Christ, and thus were born of God (1 Jn 5:1), having no conscious understanding or knowledge of any import of Christ's substitutionary death or resurrection. Furthermore, what makes this information all the more important is the fact that the disciples, in actuality, consciously and verbally denied the death and resurrection of Jesus Christ, even though they were infallibly foretold to them by Him. The disciples wilfully contradicted Jesus' statements concerning His death and resurrection! These particulars cannot be overemphasized. The disciples consciously disclaimed this information yet still believed that Jesus was the Christ; and according to John's simple assertion, that has no exception, "Whoever believes that Jesus is the Christ is born of God" (1 Jn 5:1). This illustrates our logic from above. No matter what else may be true about a person, if he believes that Jesus is the Christ, he is born of God. Said another way, no one may be excluded from being identified as a born-again child of God if they believe that Jesus is the Christ. This holds up no matter what else is true about them. 1) A born again person is one who believes that Jesus is the Christ, no exceptions. 2) One may believe that Jesus is the Christ apart from understanding and assent to facts concerning His substitutionary death and bodily resurrection. Therefore, is must be concluded that conscious understanding and assent to Christ's death and resurrection are not contents to saving faith. In this article we have not considered what it actually means to believe that Jesus is the Christ in a soteriological sense (in other words, in a saving way). But what we have done is preclude the assumptions made by many that conscious understanding and assent to Christ's death and resurrection, which facts are the essential basis for salvation, are God-mandated contents for saving faith. 'Whoever [simply] believes that Jesus is the Christ is born of God' (1 John 5:1). Do you believe this? Are We Robbed of John 3:16? -- What does "believing in" Jesus really mean? By all considerations, preaching of the cross is essential and necessary, for by so doing, all men will be drawn to faith in Christ for eternal life (Jn 12:32). But as a final note, we must present to lost men and women what precisely, without ambiguity and confusion, is the condition for the reception of irrevocable eternal life: FAITH ALONE IN CHRIST ALONE. 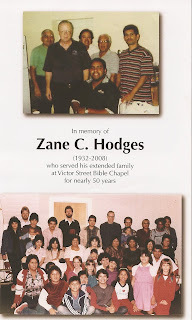 I stumbled across a very tender and heartfelt tribute to Zane Hodges that brought tears to my eyes. I believe that you all will benefit from reading it. 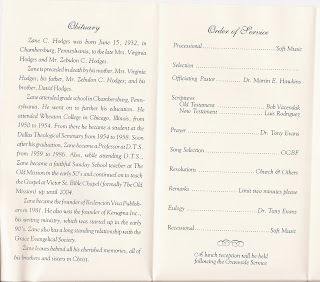 Let this pastor know that you loved Zane too. I have the distinct pleasure of introducing to you a friend who I am certain will have an impact on your life as he has and continues to have in mine. This man has a fascinating history in his some 45 years and I have come to love and appreciate him dearly. His name is René A. López. René received his Th.M. from Dallas Theological Seminary and is inches away from a Doctorate from the same establishment. His emphasis has been exegesis in the original languages, and in this task he has become a seasoned veteran. During this time his careful and well-researched exegetical writings have been published in several important journals, including Bibliotecha Sacra and the Journal of the Grace Evangelical Society. He is a member of the Evangelical Theological Society (ETS) and faithfully delivers papers at their annual conferences on varieties of pertinent and timely issues. René has written two extremely important books that deserve prominent places upon your bookshelf: The Jesus Family Tomb, which debunks the outlandish claim that Jesus Christ’s remains have been found, and Romans Unlocked: Power to Deliver, a masterful new commentary on the Book of Romans. Unfettered and not bound to uncritical and unquestioned allegiance to traditionalist interpretations, René is a free thinker who desires the truth of the Scriptures rather than the praise and approval of any established theological system. But most importantly, he is a man whose devotion to Jesus and careful fidelity to the Word of God coupled with his exegetical skills and writing capabilities will awe you, opening up the Scriptures for you in a fresh new way that will encourage and strengthen you in your walk with Christ. René is the founder of Scripture Unlocked Ministries which can be found at www.scriptureunlocked.com and is now proudly linked to here at Free Grace Theology Blog. René’s ministry website is a veritable wealth of theological knowledge. Of great interest to the readers of Free Grace Theology Blog will be his database of various theological articles written by him and others: Scripture Unlocked free grace articles. There are many other features to his ministry site that should be thoroughly searched. 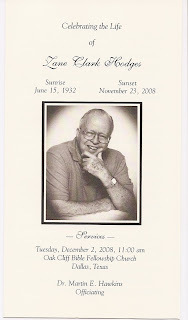 Stay tuned for some pictures of the funeral, graveside service, and reception, as well as some commentary about the funeral. 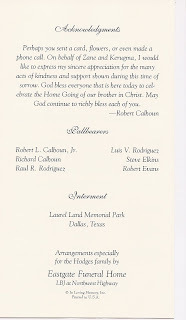 The following are pages of tribute from two printed handouts at Zane's funeral. Please click on them for larger images. Check back in a few days for some descriptions of this day. God bless you all.